As cool as the Wampa creatures are in The Empire Strikes Back, they were only in the movie for like two seconds literally. However, the original plan was to include more of them. This scene is another that was deleted and featured the Wampas. In this scene, C-3PO tears a warning sign off of a door with Wampas inside, hoping to trick the pursuing Snowtroopers. And they fall for it perfectly. Still, I can see why this scene didn’t work. 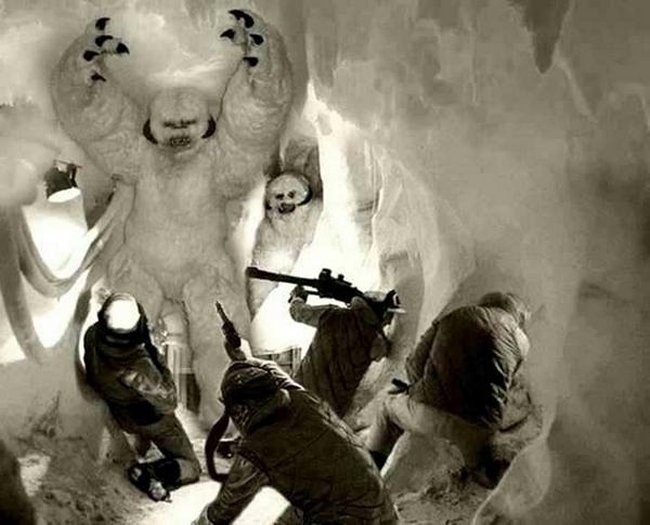 This photo from The Empire Strikes Back is a still from one of the deleted scenes from the film that featured Wampas. Here, the rebels are facing a group of the creatures and I don’t think they will win. I do think they will die. And quickly. Maybe the Wampas will return in Episode VII, but we’re not holding our breath.